Retail $4.03 SAVE 28% ! I&apos;ve used Testor&apos;s Plastic Model Cement as long as I can remember and, ironically, Testor&apos;s plastic model cement is older than I am, but not by much. I complain about it from time to time when getting the exact amount I need out of the tube and when I don&apos;t get an adequate weld for smaller parts; however, the ready availability, consistency of product and years of experience make it my number one choice for general modeling use. I use other glues and adhesives depending on the application and my arsenal of glues has expanded over the years. But, when it comes to good ole plastic model assembly, Testor&apos;s Plastic Model Cement is always within reach on my workbench. Quick drying cement for plastic models Joins polystyrene to polystyrene and polystyrene to wood Also useful for repairing household items made of polystyrene or ABS plastics Carded packaging. This glue is decent for its price two tubes and glue tips. However it is not the strongest when you are glueing wings and landing gear it is better to use super glue or liquid cement for that. The glue tips are nice and keep the glue from going everywhere and with some thinner or assitone it is easy to clean the tips. This glue is nice when your putting parts like the fusaloge or wing haves together because the glue squeezes out and fills any gaps so you just have to sand. 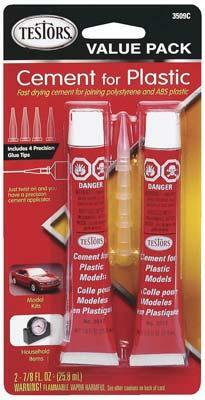 I have enjoyed this glue it is cheap easy to use and is also strong. This glue dries in descent time, and is wonderful for all sorts of plastic models; but should be used sparingly on small model parts. I have used this glue since I began modeling and it has always served me well (when I did not use overkill amounts or break a piece too often - the glue has a harder time gluing over already dried glue). It certainly dries faster than the non-toxic stuff. My only real problem is that it has a strong odor that gives people with sensitive noses headaches. However, this is the best glue that I have yet had experience with and I would certainly recommend this stuff to anyone, and especially to beginners (since it&apos;s cheap). I would also recommend buying the caps Testors make to put on the end of these tubes to have the glue pour out in thinner lines. Young kids should be watched around this stuff because it is not non-toxic. I would highly recommend Testors Cement Glue to every modeler. However, there are a few drawbacks. One of these drawbacks is how, without applying much if any pressure to the tube, the glue comes pouring out, possibly landing on an inconvenient spot on your model. The caps provided with this kit, though, do help a little bit with this problem. If you are going to to buy cement glue, I highly recommend getting the caps with them, as it helps greatly with gluing small parts. One drawback with the caps is that the glue will dry inside the caps, and eventually will clog them. (Hint: For maximum use of the caps, I suggest buying small pins to poke holes through the partially dried glue in the caps.) Also, this glue has a strong odor. Other than that, I personally like this glue much better than Testors Non-Toxic Cement Glue, because it seems that this glue dries faster, a quality that I find especially helpful when having to hold two pieces together till the glue dries. In spite of its drawbacks, I would still highly recommend this glue. MAY CAUSE EYE, SKIN, NOSE AND THROAT IRRITATION. In case of eye contact, flush w/water. If irritation persists, call physician.